Philanthropy often can help fill the gaps in a community’s services, facilities and cultural amenities. Often a substantial gift can achieve results that might never be reached through the actions of government or businesses. Virginia has been fortunate. Various institutions and nonprofit organizations in the commonwealth have received donations that have made a huge difference in reaching ambitious goals. James and Frances McGlothlin of Bristol, Va., offer a good example of this type of game-changing philanthropy. Their names are seen on the sides of two buildings in Richmond, a $158.6 million medical education building at Virginia Commonwealth University that opened in 2013 and the $150 million, 165,000-square-foot expansion of the Virginia Museum of Fine Arts, which opened in 2010. In both cases, the McGlothlins gave substantial gifts, $25 million to VCU and $30 million to the VMFA, at crucial junctures that helped ensure the projects would be completed. Last year, the McGlothlins gave their 73-piece American art collection, worth $200 million, to the museum. The collection has become a new highlight for the museum, which had a $145 million impact on Richmond’s economy in 2014. The McGlothlins are not alone in Virginia in making this type of gift. Dwight C. Schar, and his wife Martha are giving Inova Health System $50 million to develop a cancer research institute on the 117-acre Fairfax County property it recently purchased from Exxon Mobil for $180 million. Inova plans to develop a medical campus focused on cancer research, genomics and personalized medicine. Dwight Schar is the founder and chairman of the Reston-based homebuilding and mortgage company NVR. Macon and Joan Brock of Virginia Beach last year received the national Outstanding Philanthropist award from the Association of Fundraising Professionals. The Brocks have donated more than $45 million to a variety of charitable causes in Virginia and elsewhere. Macon Brock is the chairman of Dollar Tree Inc., which he co-founded in 1986. 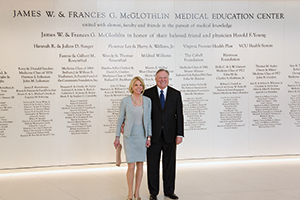 The family foundation of Fairfax County developer Milt Peterson donated $10 million last year to George Mason University for scholarships in the arts and for completion of a health sciences building. Peterson founded the Peterson Cos. in 1965. The company’s signature project is the National Harbor mixed-use development in Prince George’s County, Md. On the following pages are lists of donations from 2014 gathered as part of Virginia Business’ annual Generous Virginians Project.